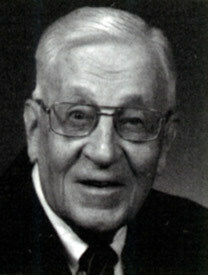 A native of Lansing, Iowa, Robert “Bob” Olson earned an undergraduate business degree from Iowa in 1933, working part-time as a student assistant in the Libraries, and graduated from the College of Law in 1935. He married Iowa City native Ruth Bywater in 1937 and worked in the public utility industry in Chicago until 1947, when he joined the Kansas City Power and Light Company. Over the next 26 years Olson held most of the executive positions in that company, becoming president in 1960 and retiring as chairman of the board in 1973. He was very active in the Kansas City business community, serving on the boards of several local corporations and volunteering his time among civic and cultural organizations. Ruth Bywater Olson died in 1979; Robert Olson in August 2003. His estate gift to the University, some $5.5 million, benefits nine programs, and includes the Robert A. and Ruth Bywater Olson Special Collections Fund. Income from that fund underwrites the Olson Graduate Research Assistantship program. The Olson Graduate Assistantships are designed to support graduate students in the course of their academic work; provide on-the-job training at the immediate pre-professional level for students who are or may become interested in Special Collections librarianship, museum curatorship, achives administration, or similar career paths; and offer opportunities to accumulate and document significant academic and work experience and accomplishment. Selection of the Olson Graduate Research Assistant will occur every Spring semester. As a graduate assistant, the incumbent earns a full-year stipend, qualifies for health insurance benefits and a full tuition scholarship at the College of Liberal Arts and Sciences resident rate. Graduate assistants must continue to be enrolled as students and forfeit the assistantship should they withdraw or graduate. The terms and conditions of employment in this position, including but not limited to wages and benefits, are governed by a collective bargaining agreement between the Board of Regents, State of Iowa, and UE Local 896/COGS, the union representing graduate teaching and research assistants at the University of Iowa. A copy of this collective bargaining agreement may be viewed from the University web site: http://hr.uiowa.edu/bargaining/cogs-contract-15. Each incoming graduate assistant will become familiar with all aspects of Special Collections work during their first year by assisting with day to day operations such as providing reference services, assisting with instruction, contributing to social media and event planning, as well as processing and describing archival or manuscript collections. In the second year of their appointments, Olson Graduate Assistants will build on the experiences they have had in the first, take on more explicit management roles, and identify project work aligned with their career goals and talents. Their first assignment, for example, will be to orient and train the incoming Olson Graduate Assistant. Some examples of project work in the past have included: processing a more extensive archival or manuscript collection, selecting and acquiring a selection of materials, or expanding catalog records for early printed books. A capstone project curating an exhibition is also available in the second year. Graduate assistants are expected to make reasonable progress toward the academic goals they outline in their applications. Olson Graduate Assistants are selected by competition. This competition is open to incoming students who have been accepted into a graduate degree program, as well as students who are currently enrolled in a graduate degree program. Students in the School of Library and Information Science, in the University of Iowa Center for the Book, or the English, History, American Studies, and Art & Art History programs may have particular interest, but applications from students in any graduate program will be carefully considered. Each candidate must submit a résumé and a statement outlining the skills or talents the candidate would bring to the department as well as outlining their academic and career aspirations and describing how appointment as an Olson Graduate Assistant would specifically forward those aspirations. The statement is particularly important and should not exceed three (3) typed pages (about 1000 words). Contact information for one or two references who can speak to the candidate’s academic and career aspirations should also be submitted. Special Collections is now accepting applications for the August 2019 – July 2021 Olson Graduate. The application deadline is Sunday, March 31st at midnight. Please send application materials to Lindsay Moen at lindsay-moen@uiowa.edu. Student in the School of Library and Information Science and the Center for the Book, Laura holds a Bachelor of Arts in Medieval-Early Modern Studies from Cornell College. Student in the School of Library and Information Science, Micaela holds a Bachelor of Arts in History and Anthropology from Augustana College. Student in the School of Library and Information Science and the Center for the Book, Hannah holds a Bachelor of Arts in Arts Management and Creative Writing with an emphasis in Poetry from the University of Wisconsin – Green Bay. Student in the School of Library and Information Science and the Center for the Book, John holds a Bachelor of Music in Horn Performance from Oklahoma State University. Kelly holds a BA in English Literature from the University of Iowa and spent two years with the US Peace Corps in Cambodia. After finishing her MLIS in 2016 she was hired to be a Librarian for the Peace Corps. Jillian holds a BA, with majors in English and French, from Creighton University and a MA in English, with a concentration in Medieval and Early Modern Studies, from the University of Victoria, and completed the dual program in the Center for the Book and the School of Library and Information Science. She is now an Instruction Librarian for the Special Collections and Archives at St. Olaf College in Minnesota. Andrea holds a BA with a major in Architecture from Washington University in St. Louis and completed the dual program in the Center for the Book and the School of Library and Information Science. Andrea is currently working as the University of Richmond’s Archivist and Book Arts Studio Coordinator. Kalmia finished her BA at New York University with a concentration in The History and Future of the Book and Print Culture. She completed her MLIS and an MFA in Book Arts and works for Public Space One in Iowa City. PhD in American Studies from the University of Iowa (2012), dissertation titled “Red Nation: The Transatlantic Relations of the American Indian Rights Movement.” Gyorgy is currently a Lecturer in the Division of History and Politics, University of Stirling, Scotland, United Kingdom. PhD candidate in History, in dissertation research on 19th century American policies toward Native Americans. Anne completed the dual program in the Center for the Book & School of Library and Information Science program in May 2010 and is currently pursuing an MFA in Book Arts at the Center for the Book on an Iowa Arts Fellowship. Anne also holds a dual BA in Art History and Art-Applied Design with an emphasis in Metals from San Diego State University. Juli holds a BA in English and Anthropology from Indiana University, an MA in Anthropology from the University of Iowa, and completed the dual Center for the Book & School of Library and Information Science program in Spring 2009. She is currently Special Collections Librarian at the University of Michigan. Student in the dual Center for the Book & School of Library and Information Science program, Nana holds an MA in Comparative Literature from Colorado and a BA from the University of Iowa. Finishing the Fellowship in June 2008, she joined her husband, a diplomat in the U.S. Foreign Service, in Tunisia; and supported by a Jacob Javits Fellowship entered the PhD program in Comparative Literature at the University of Chicago in Fall 2010. Specializing in documentary photography of the American West, Rachel completed her PhD in 2007 and is currently Assistant Professor of Art History at the University of Texas at Tyler.